Weitere Fachbereiche sind in Vorbereitung und werden sukzessive eingepflegt. Short Protocols in Protein Science provides condensed descriptions of more than 500 protocols compiled from Current Protocols in Protein Science. 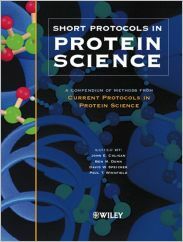 Drawing from both the original "core" manual as well as the quarterly update service, this compendium includes all step-by-step descriptions of the principal methods covered in Current Protocols in Protein Science. Strategies of Protein Purification & Characterization. Electrophoresis-Updates Expected for CPPS 10.1, 10.3, 10.10 & 10.11. Post-Translational Modification: Phosphorylation and Phosphatases. Preparation and Handling of Peptides. Appendix 1: Reagents and Solutions. Appendix 3: Commonly Used Techinques. Dunn, B. M. / Speicher, D. W. / Wingfield, P. T.
© academic-books.com, Alle Rechte vorbehalten.